With his back-facing Queen Victoria’s statue, the position of the three-metre tall bronze statue of one of Queensland’s most revered Labor premiers Thomas Joseph (TJ) Ryan sparked huge controversy when it was unveiled in Queens Garden more than 90 years ago. TJ Ryan served as Premier, Chief Secretary, and Attorney-General of Queensland from 1915 until 1919 and was known for major reforms in Labor and industrial relations, particularly promoting and drafting the workers’ compensation bill. However, his Catholicism, Irish background, Labor politics, and role in the conscription debates earned him the wrath of conservatives, loyalists, and many of the Protestant clergy. The commissioning of the statue and its placement in Queens Gardens was very divisive with Ryan’s opponents considering him to be a sectional leader, rather than one for the whole community. As premier, Ryan’s greatest success came in structural reform for sugar growers and laying the groundwork for other farming activities. State enterprises, which provided competition with monopolies, were established including butcher shops, pastoral stations, sawmills, and coal-mines. In October 1919, Ryan resigned as premier following endorsement as a candidate in Federal politics. However, due to ill health, he passed away on 1 August 1921 in Barcaldine. The statue was funded by public subscription, primarily from the Labor movement and Catholic subscribers, rather than the government and as a result Ryan’s critics claimed his statue should be placed in the grounds of a Catholic Church or Trades Hall. There was even an assertion that the Ryan statue constituted ‘£3000’s worth of insult’ and an ‘affront to the British Constitution’ because its back was turned on Queen Victoria’s statue. 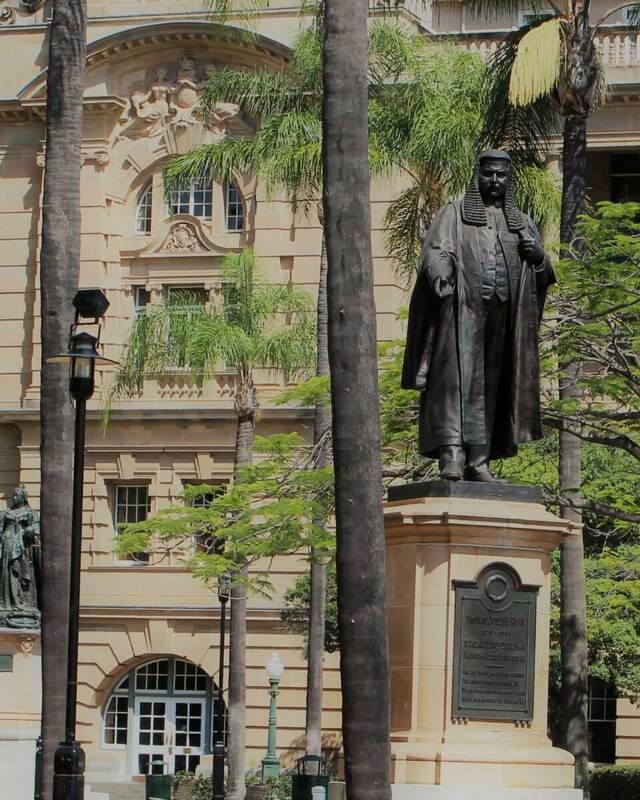 The statue, unveiled in 1925, shows Ryan in flowing gown and full-bottomed wig of a King’s Councillor, looking out to the Brisbane River. While the controversy of the statue has long since passed, Ryan’s legacy will continue to live on with the statue remaining in Queens Gardens as part of our future world-class Queen’s Wharf Brisbane development.